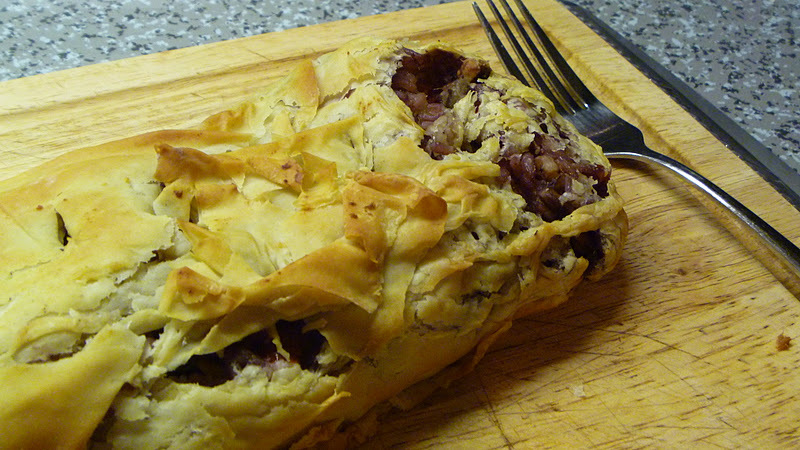 If you are Vegetarian or have a vegetarian visiting for Christmas and are stuck for ideas of what to make, this Festive Strudel is a great meat-free Christmas dinner alternative. I will be featuring more meat-free Christmas dinner ideas during the run up to Christmas, but here is a really Christmassy Festive dish to get you started. My Festive Strudel features lots of Christmassy ingredients including cranberries, walnuts, mushrooms, nutmeg and soft blue cheese. This dish was featured on Nick Coffer's Weekend Kitchen on Three Counties radio on the 10th December 2011 and was described as "Christmas in a roll" and it really is! Finely chop the onions and mushrooms. 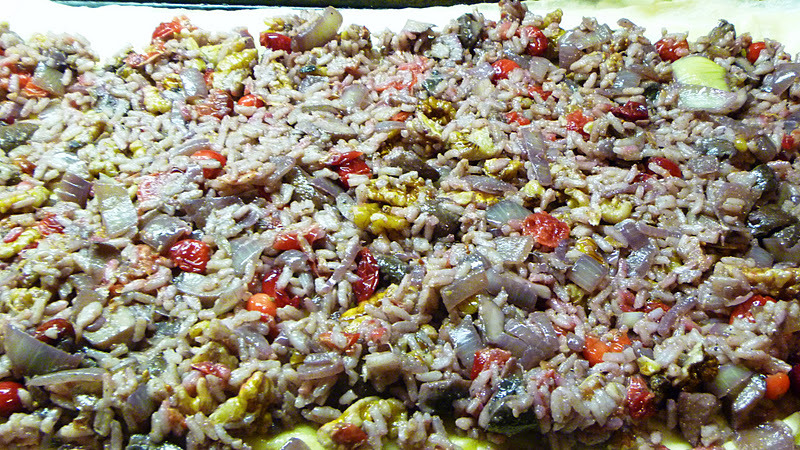 Rinse the rice, place in a saucepan, cover with water and cook on a medium heat for around ten minutes until soft ready. In a separate pan, fry the garlic and onion in the olive oil on a medium heat for around 5 minutes or until golden. Add the mushrooms to the pan and fry for a further 8 minutes until soft. In another pan, simmer the cranberries on a low heat in some water with 1 tsp of caster sugar until the cranberries start to pop (usually around 5 minutes) and then remove from the heat and drain. Pour the wine into the pan with the mushrooms and onions. Stir well and simmer over a low heat until it has evaporated, stirring occasionally. 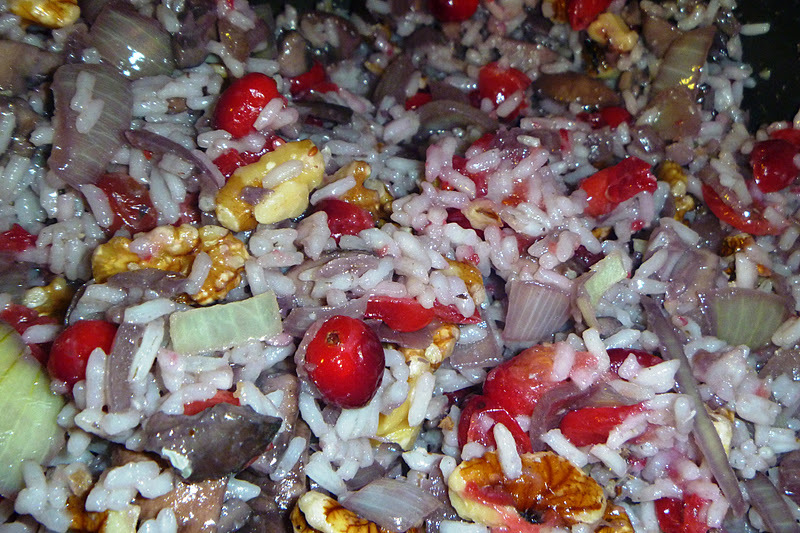 Add the cooked rice, walnuts, cranberries and nutmeg to the pan, season and stir well to combine. Cook for a further two to three minutes on a medium heat, then remove from the heat and allow to cool. Take a flat baking tray and cover with one sheet of the filo pastry. Melt the butter in a pan and then liberally brush the pastry with the butter. Cover with another 3 Sheets of pastry and brush each sheet with butter. Take half of the mixture and spread it over the pastry right to the edges. 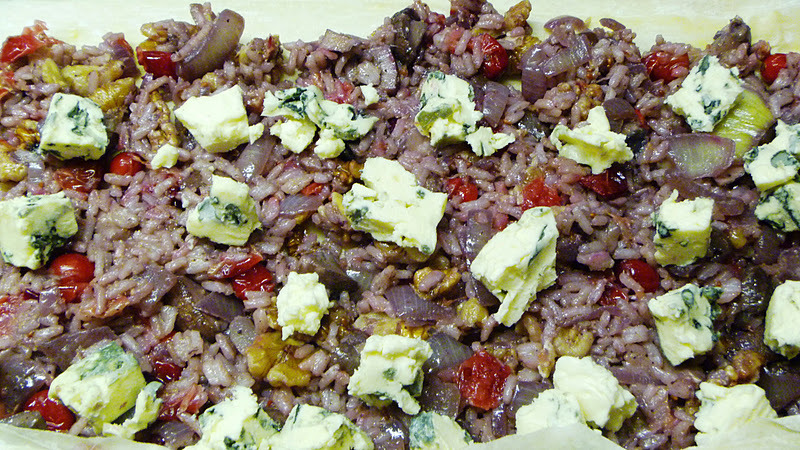 Cut the St Agur or Stilton Cheese in small pieces (you may be able to crumble it) and place it over the top of the filling. Roll the pastry up like a swiss roll and fold the ends under the seam side. Transfer the Strudel, seam side down onto a lightly greased baking tray. Brush the top of the strudel with more melted butter. You could add a couple of vent holes or a pattern on the pastry if you like. Repeat the process with the other half of the pastry and filling. Bake in a pre-heated oven for 25 to 30 minutes or until the pastry is crisp and golden. 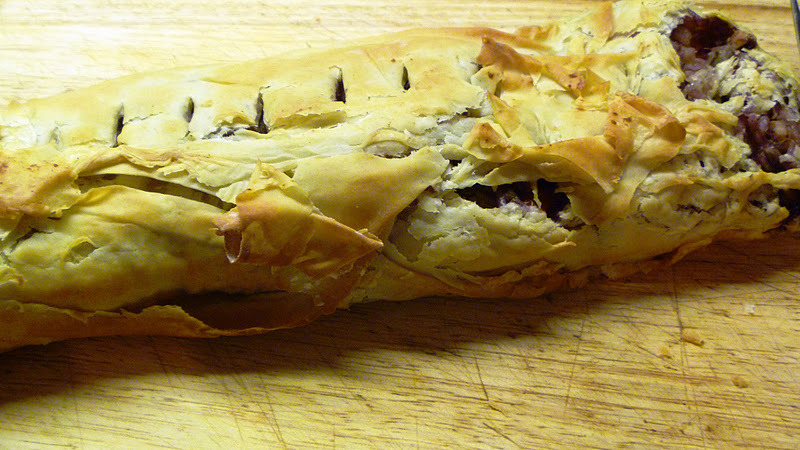 This strudel can be made and kept pre-baked in the fridge or freezer and cooked on the day of eating. You could use ready to roll Puff Pastry if you don’t like using Filo Pastry. You can cook this dish with or without the Cheese if you are not a big Blue Cheese fan. 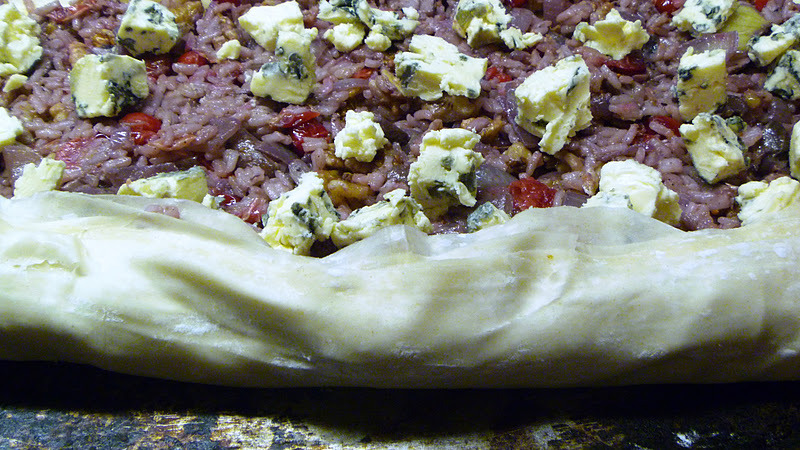 To make a Vegan alternative, cook the filling and omit the Cheese from the recipe. Use the filling to stuff a scooped out butternut squash or cooking pumpkin and bake. Place the sugar and port in a pan over a medium heat and cook until boiled. Add the Cranberries and cook for around 5 minutes until they are soft but not mushy. Remove from the heat and allow to cool. The sauce will thicken as it cools. This can be kept for a week in the fridge or 6 weeks in the freezer. 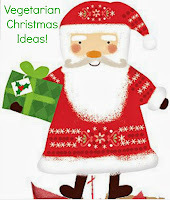 What a fantastically festive recipe.. and I love the snowflakes!! This sounds delicious. 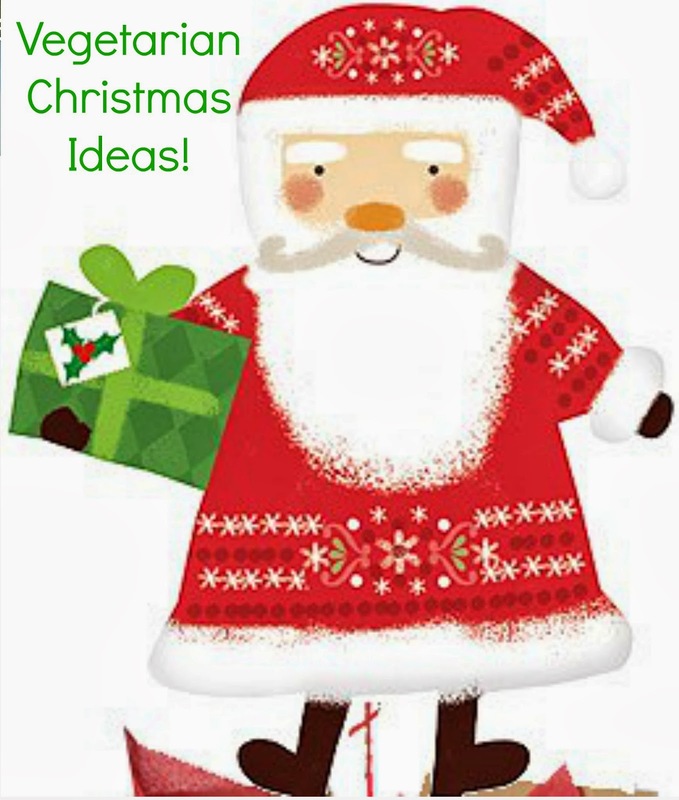 I would strongly consider it for our Christmas dinner this year, if it didn't contain lots of things that various visitors won't touch. :( I will try it out some time, though!